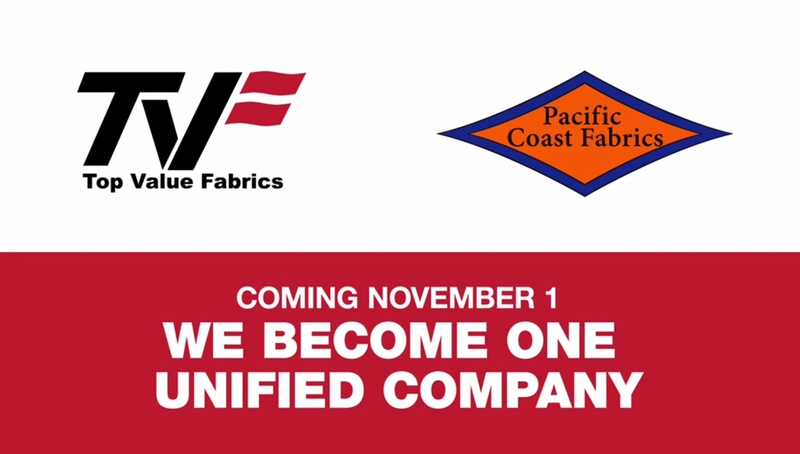 Top Value Fabrics announces the acquisition of Pacific Coast Fabrics. The acquisition expands our product offerings and strengthens our West Coast distribution network for printable textiles. Both companies enjoy a rich history of textile success. Pacific Coast Fabrics was established in Gardena, California in 1995 after Brian Vieweg and Michael Sanders, executives from Cal-Pacific Dyeing & Finishing Corporation, formed a new company to supply high quality textile goods. Cal-Pacific Dyeing & Finishing Corporation was founded in 1967, and the new company became Pacific Coast Fabrics. Brian was elected President and Michael was elected Vice President. TVF, headquartered in Carmel, Indiana, was founded in 1974, and opened its West Coast Sales and Distribution Center in Carson, California in 1987. The textile leader has added remote offices, sales and support teams, and a nationwide network of shipping locations to add convenience for customers over the years. Combined, the companies contract manufacture and source fabrics and media worldwide, both domestically and in international locations from Asia to Europe.